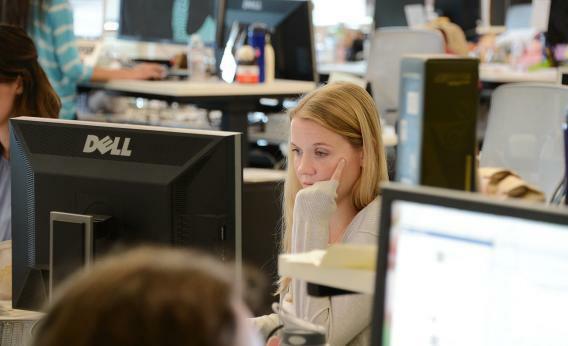 Facebook interns make $5,600 a month, Glassdoor report says. Do Facebook’s Interns Make More Money Than You? Employees work at the Facebook main campus in Menlo Park, California, May 15, 2012. Facebook is the best place in America to work, according to the jobs site Glassdoor’s Employee’s Choice Awards. The Menlo Park-based company recaptured the top ranking after dropping from first to third last year. It was followed on this year’s list by companies like McKinsey (second), Google (sixth), and In-N-Out Burger (ninth). What’s so great about Facebook? In a video Glassdoor made to celebrate the company’s award (embedded below), employees cited things like their coworkers’ passion for the job and their commitment to the company’s mission of making the world a more open and connected place. The video also shows employees playing ping-pong, walking on a treadmill while working on a laptop, and surveying the vast offerings of a cushy snack lounge. “I am constantly inspired by the people that I work with every day, and the caliber of talent all concentrated in one place brings on, like, this infectious energy,” says Melody Quintana, a Facebook content strategist. OK, so it’s not about the money. But, just curious… What about the money? Turns out that’s not too shabby either. Glassdoor estimates that the average Facebook product manager makes $132,000 a year, while software engineers take in $114,000. Ah, but what about the poor interns that the company surely exploits for some cheap coding help? Oh, they make between $5,600 and $6,300 a month—the equivalent of $65,000 to $75,000 a year. Yes, the interns. As Business Insider notes, that’s some $25,000 more than the average American worker. That might sound outrageous, but those sorts of intern wages are not unique to Facebook. Top software-engineering talent has been at a premium for years, and Facebook is competing for the best of the best with companies like Google, which pay just as much. And lest you think it’s just the tech industry that pays top dollar for promising greenhorns, those numbers are also in line with the average pay for summer analyst interns in the investment banking industry. Glassdoor reports that Citi, for instance, pays its i-banking interns a healthy $5,570 a month. Moral of the story: Mamas, don’t let your babies grow up to be journalism interns.